Olegh Kolyada`s 1998-2008 Panoptikvm Series. Recorded by Olegh Kolyada at Oda Relicta HQ in 2005-2008. Tracks 1 & 7 were originally released as "Mare Internum" EP by Drone Records as a part of 7" series. Artwork "The Sleep Of Reason" (©) by Laurie Lipton. There’s something to be said for predictability. While the experimental has its merits, sometimes there’s no substitute for good old standard-issue. For example, I love adventurous fusion cuisine, but there are moments when nothing but fast food will do it for me, and it’s satisfying in some profound way I don’t need (or want) to understand. That’s why I keep going back to it, right? This is precisely why albums like Drift in Sodom are valuable. In Meditarivm, the dark ambient outlet of the versatile Olegh Kolyada, who also runs the equally diverse Old Captain imprint in addition to being involved with multiple side-projects, delivers a solid listening experience that doesn’t stray far from genre staples. You’ll hear slow-motion chords and drones, scattered samples, and a general feeling of quiet contemplation, all arranged to flow smoothly, without fuss or bizarre instrumentation. Drift in Sodom isn’t a long album, but since it’s so consistent, it loops beautifully. This is all the more remarkable since two of the tracks, “Solitaria” and “Silentia,” were previously released. 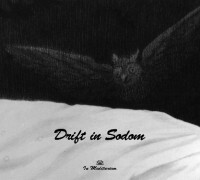 Drift in Sodom fits its title perfectly: it gathers you in and guides you with minimal distractions and through lofty, empty halls. Kolyada has done a fine job evoking a particular atmosphere; there’s little threat in these half-lit places yet plenty of haunting potential. “White are the Bones of Men” layers on the darkness in delicious fashion, with cleverly placed samples moving between speakers and well-formed drones creating a wonderfully deep space. It’s the perfect backdrop for exploring an abandoned castle while moonlight streams in through high windows, playing upon tattered tapestries gone gray and ragged with age. “Sound of Mountain” may have an unusual title, but the emotive keyboards and gentle sounds of wind conjure a strong sense of awe. It’s easy to imagine oneself pausing at a balcony in our vast castle, gazing forth at distant peaks frosted by ice and starlight. It would be easy, and perhaps even tempting, to dismiss In Meditarivm as unoriginal and superlative. It’s albums like Drift in Sodom, however, that show the value of a work that delivers its content in a straightforward manner. By the way, I don’t mean to imply that this album is the fast-food version of dark ambient; oh no, it’s certainly more than that. Kolyada has keen insight into what makes the genre so attractive, and he knows how to make good on it. He adds just enough exotic strings and pipes to “Black Ziggurat” to communicate place and time without being too blatant; the track becomes an ode to a fallen empire that once ruled the land with glory. There isn’t much of a cohesive concept in Drift in Sodom, but when the music is delivered with such poise, it doesn’t need one. Ignore the track titles and let yourself sink in; not every album needs to engage you on multiple levels. You may have heard these basic sounds before, but that doesn’t mean Drift in Sodom isn’t a keeper; they’re put together with careful and patient efficiency. Don’t be surprised if this is an album you return to. I listen to a good deal of dark ambient, and this is one I keep revisiting. Every collection needs solid, reliable works like this. Ci eravamo occupati circa quattro anni fa di questo progetto ucraino, ex-duo ora facente capo al solo Olegh Kolyada (First Human Ferro, Ostarbeiter, Oda Relicta e titolare dell'etichetta Old Captain), segnatamente in occasione di "The Great Limbo", raccolta di materiale del primissimo periodo (1998-2001) con estratti anche dal repertorio di First Human Ferro. Un anno fa è uscita la 'parte II' di "The Great Limbo", ma solo in formato digitale, e sempre nell'estate 2013 è poi uscito anche questo "Drift In Sodom", contenente materiale registrato fra il 2005 e il 2008, inclusi i due brani del vinile 7" del 2005 "Mare Internum" (ultimo lavoro a due che ha coinvolto anche Sergey Svistelnik). Prosegue quindi l'operazione di recupero di materiale inedito o fuori catalogo per In Meditarivm, stavolta con una collezione di brani non solo più concisa, ma anche meno variegata e più univoca nella direzione sonora intrapresa rispetto al materiale di "The Great Limbo". Se i due brani del succitato 7", posti rispettivamente in apertura ed in chiusura del CD, si muovono nei più classici meandri della materia dark ambient, altrettanto fanno le altre cinque tracce incluse, ora con linee più melodiose ("Calvarium", "Sound Of Mountain" con le sue meste folate e "Black Ziggurat", quest'ultima impreziosita da mirabili campionamenti), ora con fare più inquietante ("White Are The Bones Of Men"), elevandosi anche su toni celestiali ("Sandstorm"). In meno di 40 minuti quest'operazione di recupero ci dà la misura di cosa significhi fare veramente dark ambient, non solo a livello tecnico o di esperienza maturata sul campo, ma anche e soprattutto in termini di capacità descrittiva dei suoni ed efficacia nello stimolare sensazioni e visioni (sfruttando le giuste intuizioni senza mai strafare), magari con idee sicuramente non rivoluzionarie, ma di indubbio buon gusto e di comprovata qualità. Per i puristi della dark ambient, In Meditarivm resta a pieno titolo uno dei nomi su cui puntare senza remore.